August 30 2011 marked the International Day of Forced Disappearances, which in Colombia was an opportunity to place this human rights issue at the forefront of the country’s national political debate. A year before, a report released by the Latin American Working Group stated that the subject of forced disappearances has been overshadowed by the high number of deaths, assassinations, and other forms of violence that occur in Colombia and often dominate media reports. 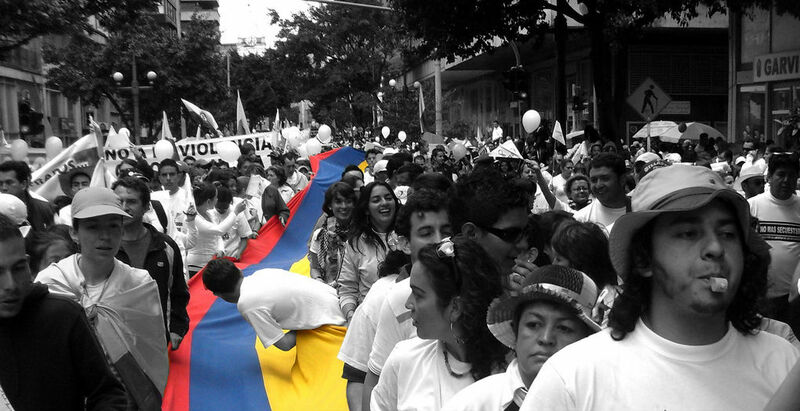 Considering Colombia was registering some of the highest numbers of forced disappearances in Latin America, the occasion was particularly important for human rights defenders from both national and international organizations that wished to make this issue visible via demonstrations, events, publications, and debates throughout the whole country. 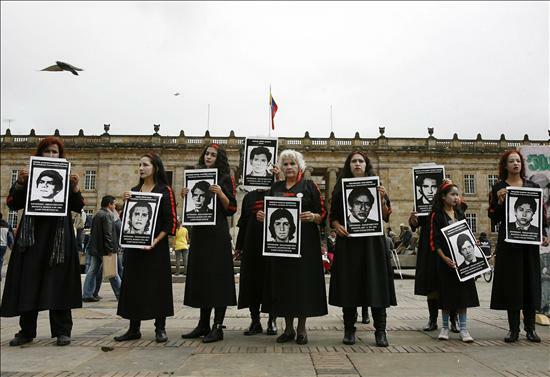 The International Day of Forced Disappearances and its associated events highlighted the legal deficiencies in the Colombian justice system in relation to its responses regarding the ongoing spate of human rights violations. Figures from the National Commission for the Search of Disappeared Persons – a permanent national body, created in 2000 by Law 589 – suggest that after more than 50 years of internal conflict, they have witnessed at least 61,604 cases of forced disappearances. Colombia stands first amongst such countries with the most disappearances in Latin America, even more than Argentina, where disappearances occurred mainly during the Dirty War. This means that thousands of Colombians have undeniably been subjected to arbitrary arrests and abductions “by the state or agents of the state who then deny that the person is being held or conceal their whereabouts, placing them outside the protection of the law.” The state operatives, paramilitaries, and guerrillas have been complicit in these crimes. The process of ‘disappearing’ Colombian civilians, which has evolved over a long period of time, has been used as a mechanism of controlling populations, suppressing political opposition, and instilling fear amongst the local population, usually with total impunity. The disappearances can occur for a variety of reasons, ranging from politically motivated kidnappings – the targets often being human rights defenders or trade unionists – to the “social cleansing” of those Afro-Colombian and indigenous rural populations living in conflict zones who are reluctant to cooperate. This is an ongoing practice as shown by the disappearance on February 19, 2011 of Colombian environmentalist Sandra Viviana Cuellar. 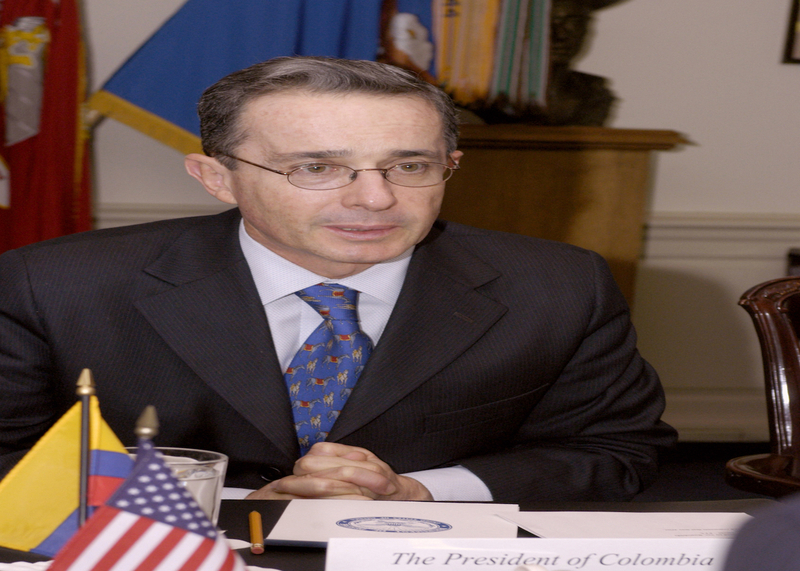 Unlike Argentina or Chile where this type of human rights violation had occurred in the context of military juntas, the democratically elected Colombian government has been participating for more than five decades, either actively or by means of calculated inaction in what can be defined as “state terrorism”. Despite some legal progress (Law 589 of 2000, Law 707 of the Inter-American Convention on Forced Disappearance of Persons that was ratified by Colombia in April 2005), the perpetrators of enforced disappearances still act with impunity, which results in an ongoing battle for justice fought by families of the victims along with national and international human rights bodies. Colombia’s 1991 Constitution prohibits forced disappearances, but this prohibition was rarely legally enforced, as the cases often proved very difficult to prosecute in the physical absence of a body or the lack of evidence that proved the missing person to actually be dead. In 2000, Law 589 was passed, which allowed for criminal prosecution of perpetrators and made the applicable legal framework much more effective. “Law 589 places responsibility on the state to take actions to locate victims of forced disappearances, although it identifies forced disappearances as a crime that can be committed by non-state as well as state actors. It sets up a National Search Commission (Comisión Nacional de Búsqueda), a National Registry of Disappeared People, and an Urgent Search”. However, instances of cases of forced disappearances that have been brought to trial are relatively rare. One notable exception is the June 2010 sentence handed down to Colonel Luis Alfonso Plazas Vega, a senior Colombian army officer, by Judge Maria Stella Jara, who has been a member of the judicial circuit for cases on terrorism. Vega was sentenced to 30 years in prison for his role in the disappearance of eleven people in November 1985. The United Nations (U.N.) High Commissioner for Human Rights Navi Pillay classified this decision as historic (President Juan Manuel Santos, on the other hand, called the sentencing unjust) and appealed to the Colombian government to offer protection to the judge, who had been receiving death threats. The Justice and Peace Law passed by the administration of Álvaro Uribe in 2005 committed the government to the demobilization of thousands of paramilitaries. Testimonials of ex-paramilitaries could, in theory, have resulted in leads as to the whereabouts of the disappeared, and such efforts could therefore have helped to recover some bodies. But in practice most paramilitaries brought before the courts only testified to throwing bodies into the sea or destroying them. In addition, the law reduced the sentence for committing forced disappearances to a maximum of eight years as opposed to the previous 25-60 year sentence. As far as international conventions ratified by Colombia are concerned, one can refer to the U.N.’s International Convention for the Protection of All Persons from Enforced Disappearance, signed in 2007 and ratified in October 2010: “This will permit the U.N. working group on forced disappearances not only to receive testimony from Colombia but to carry out investigations, and would provide another potentially useful tool for Colombian advocates and victims.” The same applies to The Inter-American Convention on Forced Disappearance of Persons, approved, signed, and ratified by the Colombian government in April 2005. These international means of investigation that offer protection against social derelictions like forced disappearances nonetheless depend on the Colombian national justice system. Every forced disappearance violates a wide range of human rights such as the right to individual security and dignity, the right not to be subjected to torture or other cruel, inhuman or degrading treatment or punishment, and the right to humane conditions of detention, a legal representative, and a fair trial. However, despite having all the required instruments and legal powers available in order to rule on cases of forced disappearances, the “double standard” of the Colombian state makes them difficult to apply. This is because, although the government has provided the legal powers necessary to prosecute the perpetrators and has ratified various conventions, it does not put them to the applied test. To complicate matters, the Colombian government does not recognize families of victims as victims themselves as does the Inter-American Court. This limits the resources available to affected families who often turn to nongovernmental groups working on forced disappearances in order to obtain justice and reparation. The national organizations investigating and taking action on this matter offer a variety of strategies to involve themselves in these processes. Apart from assisting with legal aid, they also focus on strengthening the action of the communities, providing vital psychosocial assistance, social protection, visibility, and advocacy. One of the most active of these, the MOVICE (Movimiento de Víctimas de Crímenes de Estado) has helped register and develop a database relating to the disappeared and has assisted with the process of researching and identifying the bodies that have been recovered but remain unidentified; they are referred to as N.N. : literally, nomen nescio, or in English No Name). The organization has also developed a “gallery of memory” – galería de la memoria – in order to direct attention to these shocking state crimes. Photographs from this gallery were used during MOVICE demonstrations throughout Colombia and were placed all over important sites in Bogotá on August 30,2011. 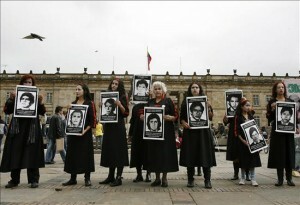 The International Day of Forced Disappearances provided the occasion to place this human rights issue, and the failings of Bogotá, at the forefront of the national and international scene. National human rights organizations attempted to highlight Colombia’s very high disappearance figures and appealed for international aid in order to draw attention to the situation. Throughout the country, non-governmental organizations (NGOs) have led various demonstrations in an attempt to encourage the entire civil society to denounce the actions of the state and its baleful role in the ongoing “disappearance” scandal. Many people attended these events, including the families of victims and members of human rights organizations. Justice for victims certainly cannot be achieved in one day, but the confluence of victims’ demands for justice, the manifestation of these demands through demonstrations organized by NGOs, and the weak moral position of the Colombian government in relation to this issue should elucidate that there is a real need for a solution, and that an international response is necessary. A number of international bodies had representatives in Colombia during the week of August 30. For example, the Inter-American Court of Human Rights carried out several conferences to unite members of the national and international community in order to reflect on the recent achievements, advances, and problems regarding the Colombian justice system. The theme of forced disappearances was approached positively in terms of legal achievements, but emphasized the need for a proper internal system in order for the Declaration of International Human Rights to help forge preventive approaches; Fabian Salvioli, vice president of the U.N. Committee of Human Rights, affirmed that in his experience no state had ever done “absolutely everything” in order to resolve this problem. Many human rights organizations’ field offices in Colombia, most notably, various U.N. agencies, as well as representatives of the Inter-American Court of Human Rights, are present to ensure that international standards of human rights are maintained and not violated or simply forgotten. They rely heavily on the testimonies of national organizations in the field; there are nevertheless recognizable limits and deficiencies in the application of the legal system. A 2005 report by the U.N. Working Group explained that “having too many institutions and agencies operating within and across different arms of government, including the legislative, executive and judicial, each with their own competing programs and missions; […][produces a] lack of central coordination; poor inter-agency communication; fragmentation of authority […] can only lead to ineffective and weak policy implementation”. The extensive and rising list of forced disappearances demonstrate that the situation is increasing dramatically. The local legal system would significantly improve local conditions if it were restructured to become more transparent, and especially so if those who find themselves in this category had the ability to adequately prosecute disappearance crimes, which continue to be perpetrated with total impunity. Moreover, this issue affects several Latin American countries in which national governments have not taken the required steps to lessen impunity and enhance their access to justice for victims and their families. There have been increasing demands from members of the international community like the Inter-American Court, the U.N., and the European Commission, which recently broke its historical silence and requested that President Santos ratify the International Convention for the Protection of All Persons from Forced Disappearances. The government of Juan Manuel Santos has not made any clear statements, nor taken steps in order to improve Colombian legal procedures, such as the prosecution of criminals and the implementation of preventive actions. In order to prevent disappearances and protect those testifying in court (relatives of victims, government investigators, exhumation teams, or nongovernmental organizations working on this issue), a change is needed regarding the application of conventions that have been ratified. Providing additional international assistance to the authorities in Colombia is one aspect, but more importantly, there ought to be a shift in terms of the use of the legal system. The strong ties between the perpetrators of forced disappearances and the state must be kept in mind, as such ties can certainly delay possible improvements in the application of justice in the country.